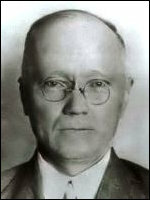 Tomashivsky, Stepan [Степан Томашівський] – historian, diplomat; born on 9 January 1875 in the village of Kupnovychi (Sambir raion, Lviv oblast, Ukraine; at that time – Rudky county, Austrian crown land of Galicia); died on 21 December 1930 in Kraków, Poland. In 1901-1906 Tomashivsky worked as a gymnasium secondary school teacher in Peremyshl and Berezhany. In 1904 he obtained a PhD degree from the University of Lviv. From 1906 he taught in Lviv and in 1912-1914 was a reader (docent) in Austrian history at Lviv University. During the First World War he lived in the Transcarpathia region and in Vienna. He was a Full Member of the Shevchenko Scientific Society in Lviv (from June 1899) and acting head of the Society (1913-1918). From February 1919 Tomashivsky was a member of the diplomatic mission of the Ukrainian People’s Republic (UNR) in Switzerland, and subsequently a member of the UNR delegation at the Paris Peace Conference. From the beginning of 1920 he was a member of the Western Ukrainian People’s Republic (ZUNR) delegation at the Paris conference; from June 1920 he was its acting head. In the autumn of 1920 he became head of the newly established diplomatic mission of the ZUNR in London. On 21 January 1921, at his own request, he ceased to be head of the ZUNR missions in Paris and London, though he remained a member of the London mission until 1 August 1921. While staying in London, in addition to his diplomatic work, he also undertook academic research in the city’s libraries. From the second half of 1921 he lived in Berlin, where he wrote for the Ukrainske slovo newspaper and edited the weekly Litopys polityky, pysmenstva i mystetstva. In 1925 he returned to Lviv where he edited the Polityka newspaper and worked as a gymnasium teacher. From September 1928 he taught in Kraków and a year later became a professor of history at Kraków University. Tomashivsky wrote over 50 major works on Ukrainian history and about 230 articles and reviews.